Design is a powerful force. It can teach us something new, provide useful information, and even help us choose how to spend our money. Because humans are visual, we link feelings and memories with images, and we store those images in our brains automatically, using them later to make judgments and decisions throughout the day, every day. By drawing on those collective cultural images stored in our memories, design can push us to imagine and envision anything, even things that don’t yet exist. Even new worlds. As globalization has shrunk distances and made faraway cultures more accessible, NASA has continued to push our exploratory boundaries even further beyond our own world. Now, even the acronym NASA may be a signal to some that this is about to turn into a boring textbook lecture filled with scientific jargon that’s nearly impossible to decipher, but NASA’s Jet Propulsion Laboratory (JPL) has tapped into the power of visual design to alter that assumption. 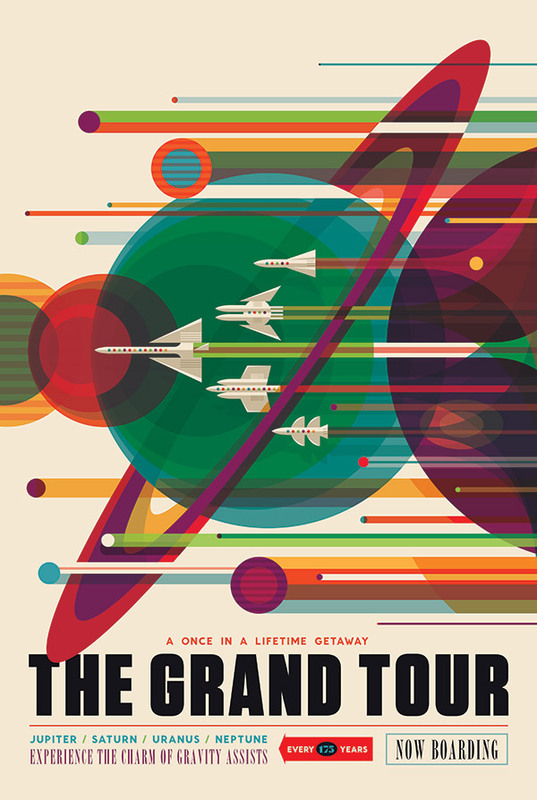 NASA’s JPL has designed and produced a set of space exploration posters, each highlighting a planet, star, or other space discovery and presenting it in a style reminiscent of retro movie posters a la Saul Bass. These posters do more than just highlight some of NASA’s space discoveries – they make us want to learn about them because they’re visually appealing, intriguing, and inviting. Let’s visit (the poster of) Mars! You probably notice the text “MARS” first, then your eyes may travel to the center of the poster to what looks like a bullseye. From there, your gaze may continue to move out from the center in a bigger circle, noting the profile of the astronaut and continuing to review the details within the poster with this circular gaze. After this first once-over, what’s your impression of Mars? You might first think “round”, in reference to the way it led your eyes around from detail to detail. Next description to come to mind may be “red” because of the most prominent color. Maybe, touching on the human elements of the poster, such as the astronaut, the land rover, the city buildings, the water drops, and the plants, you may think it’s capable of supporting human life. But maybe this one was too easy. Mars, being Earth’s next door neighbor, may be familiar to most people. What about the posters depicting less common space discoveries? Can we learn about something new from a poster alone? Before writing this, I didn’t know anything about Ceres. Here are my initial thoughts based on my first impression of this poster: Ceres is an asteroid in our solar system; it’s cold and dark; it’s located on the edge of something, maybe the edge of landable, moonwalkable space objects. The poster gave me those impressions because of its cool color scheme consisting entirely of white, black, and blue-toned grays. This gives it a cold, dark feeling. The two figures seem to be standing on the edge of the frontier, watering up at the pump before heading out into the unknown. After jotting down my initial thoughts, I looked up Ceres to see how close I was. Ceres is a dwarf planet in the asteroid belt in between Mars and Jupiter, though it’s actually within the orbit of Neptune. It consists of mostly rock and ice. Not bad! Because of JPL’s poster designs, I’ve researched these different planets and stars and space discoveries, none of which are my usual go-to topics of interest. Just the thought of being blasted out of the Earth’s atmosphere in a space ship terrifies me. But I am a design fan, and these posters are so visually arresting and intriguing that they pulled me in and made me want to learn more about a topic that I probably wouldn’t have been so interested in otherwise. As companies try to court new customers, it’s important to remember that although having a quality product is key, presenting that product in an inviting way that’s accessible to more than a limited niche market of people can help to broaden a client base, or at least garner additional interest. NASA’s work may be beyond the realm of understanding for most of us, but they’ve opened it up to a lot more people through this design project.